For example we are taking the example of Translation in "Hindi". Register and request to translate. 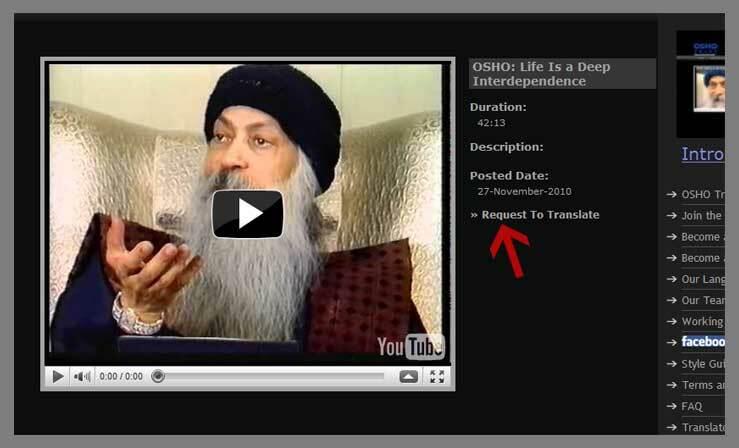 Once you are registered to OSHOTALKs, you can select any video and click on "Request to Translation" for the translation in Hindi. Requirements for translating in Hindi. - Downlaod ADD-ON for Firefox - Google Transliteration for Hindi from here and install it then restart the firefox. Wait and follow the link for Tranlation. Once you have requested you will recieve an email from OSHOTALKS with an approval of the request. There will be an additional email from dotSUB in the dotSUB email click on the link "Translate Link". Enter your login details to go to translation page of the video you had requested. How to use add-on to type in Hindi. If you have succefully installed the add-on and have restarted Firefox then you will be able to see the language box on the right hand corner, from the drop down list you will be able to choose hindi or other indian languages. Hoorrrray! There you go, just start typing in phonetic. It's also called &quote;Hinglish". 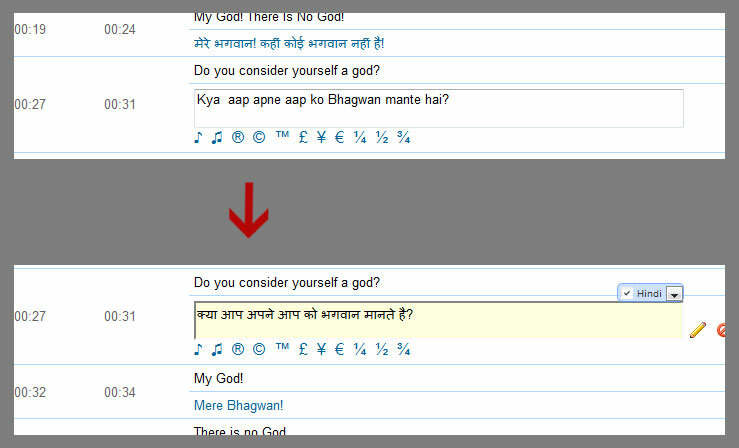 If you want to type the translation of "Do you consider yourself a god?" in Hindi, then type it in Hinglish "Kya aap apne aap ko Bhagwan mante hai?" and it will automatically convert in Hindi. But for that you should also know how to write Hindi in English, which is called "Hinglish" it is very simple. Just start translating and you will be better and better in this. All the best and enjoy reading OSHO while translating!